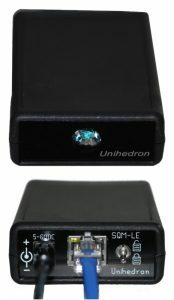 Knightware’s SQM Reader software is the only commercially available software that reads sky darkness data from Unihedron’s connected Sky Quality Meters automatically and continuously, displays and graphs data, stores data in files and transfers it to an FTP server and post processing scripts, batch files and programs. – S QM Reader is a free package that allows you to read a meter and view the dark sky result in magnitudes per square arcsecond and theoretical Naked Eye Limiting Magnitude. These values can be stored in a file in comma separated value (CSV) format. – SQM Reader Pro 3 adds graphing, statistical calculations, extended data storage and transmission capabilities to the basic feature set of SQM Reader, allowing you to understand how light pollution affects your dark sky over time. It also supports the Skyglow Standard data file format. Readings can be submitted automatically to a live SQM Readings Map web page by clicking here. Readings may be stored in two data file formats, including the international standard Skyglow Observation format (see Skyglow Standard information here ). The standard format allows data to be shared with dark sky researchers around the world. Data files in both formats may also be re-opened and processed with SQM Reader Pro 3. SQM Reader Pro includes support for the SQM-LU-DL data logger meter. Users can check the status of FLASH memory in the meter, read and erase all records, and set the real-time clock. SQM Reader Pro 3 is designed for modern high-resolution displays, and it operates on 32 and 64-bit editions of Windows 10, 8 and 7. It ships with several ‘skins’ that allow you to customize the appearance of the program and the screenshot images of it that may be transferred to an FTP server. It supports reading SQM models LE (Ethernet), LU and LU-DL (USB) and LR (RS-232). It includes thorough documentation, online product support and online product updates. For full product description, please visit the http://www.knightware.biz/sqm/ . 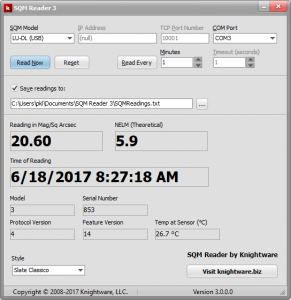 SQM Reader Pro 3 is available by digital delivery ($50) and on CD ($60) directly from Knightware. – Personal use: Connect a Sky Quality Meter directly to your laptop in the field or to your observatory computer. Dark sky readings can be viewed immediately and stored for later analysis. – Star Party or Club observing site use: Connect the model LE to a wireless router in the field and allow wireless connection to computers within range. Any user can receive dark sky readings from the meter wirelessly. – Remote observatory use: Connect the model LE to a publicly addressable network. Any user can receive dark sky readings from the meter through the Internet. – Web page: Connect any Sky Quality Meter to a computer that is also connected to the Internet. Send the latest live readings graph to your web page via FTP (SQM Reader Pro 3 only), and send the latest live readings to Knightware’s SQM Readings Map page.